Aims To report long-term clinical outcome of topical 1% 5-fluoruracil (5-FU) as a sole treatment of ocular surface squamous neoplasia (OSSN). Methods 41 patients affected by OSSN were included. Each patient underwent full ophthalmological examination at baseline, with cytological or histological confirmation. Patients were treated by topical chemotherapy with 1% 5-FU four times a day for 4 weeks. One course was defined as 4 weeks of topical chemotherapy. Adjunctive courses were administered after 1 month of chemotherapy-free interval. Results Mean follow-up was 105±32 months (range 60–171 months). Complete tumour regression was achieved in 34 cases (83%) after a mean of 1.5 courses (range, 1–3 courses). Univariate analysis revealed that complete response was significantly related to tumour thickness <1.5 mm (p=0.005), lack of fornix or tarsal involvement (p=0.015 and p=0.009, respectively) and the absence of multifocality (p=0.002). Histopathological diagnosis (intraepithelial neoplasia vs squamous cell carcinoma, p=0.019) and American Joint Committee on Cancer (AJCC) classification (T1 vs T2 or T3) (p=0.028) were also related to incomplete tumour response. In a multivariate analysis, just tumour thickness >1.5 mm (p=0.045) and multifocality (p=0.023) were correlated with incomplete tumour response. Transient and reversible low-to-mild local side effects were documented in 19 (48%) eyes. Conclusion Topical 5-FU, as a sole therapy, is a long-term safe and effective treatment for patients affected by preinvasive OSSN and for a limited proportion (50%) of invasive OSSN. Compared with mitomycin C (MMC) and interferon (IFN)-α2b, only a few papers have been published about the use of topical 5-fluoruracil (5-FU).4–12 5-FU is a cell cycle-specific pyrimidine analogue with cytotoxic properties due to its effect on both DNA and RNA. 5-FU acts on rapidly proliferating epithelial cells and has therefore been used as a topical treatment for preinvasive OSSN since mid-1980.13 Since 2001, topical 1% 5-FU was introduced in our Centre as a first-line treatment of previously untreated OSSN, including selected SCCs. The aim of the present paper is to report, on a long-term range, the clinical outcomes of topical 1% 5-FU used as a first-line treatment of OSSN. The Collaborative Prospective Maintained Ocular Oncology Database at our Ocular Oncology Unit was queried under prospectively obtained institutional review board approval. Each patient signed an individual informed consent. The study was also conducted in adherence to the Declaration of Helsinki. To be included in this retrospective case series, each patient should be affected by cytologically or histologically confirmed OSSN, aged 21 years or older and treated by topical 1% 5-FU as a sole and primary treatment of OSSN. Exclusion criteria were as follows: any previous treatments of the OSSN and follow-up shorter than 5 years. Each patient underwent full ophthalmological examination at baseline. Clinical and demographic characteristics were collected, including: age, gender, involved eye, race, number of clock hours of limbus involvement, tumour largest basal diameter (LBD) by direct measurement using slit-lamp biomicroscopy or by indirect measurement in anterior segment photography and estimated tumour thickness (less than 1.5 mm vs more than 1.5 mm, determined by ultrasound biomicroscopy or assuming a lid margin thickness of 1.5 mm and estimating tumour thickness comparing with it). Since 2005, tumour thickness was also confirmed by in vivo clinical confocal microscopy (ConfoScan4, Nidek, Gamagori, Japan).14 The presence of clinically detectable fornix and tarsal involvement and the presence of multifocality were documented by anterior segment photography. The number of clinically detectable lesions in multifocal tumours was also recorded. Tumours were also staged based on the American Joint Committee on Cancer (AJCC) clinical staging system,15 and tumour clinical aspect was documented by anterior segment photography in each case. Scraping cytology was obtained from each patient at baseline and reported as previously described.1 ,14 Briefly, cytological analysis was reported as low-grade dysplasia (LGD) (cells with enlarged nuclei, hyperchromasia and irregular contour of the nuclear membrane with increased nuclear/cytoplasmic ratio) and high-grade dysplasia (HGD) (pleomorphism of the nucleus with dyskeratotic cells).1 ,14 The presence of syncytial sheath, nucleoli and infiltration of inflammatory cells was reported as suspected of invasive SCC.1 ,14 Each case of SCC suspected by cytology was proven by histopathology (full-thickness biopsy). All patients underwent topical chemotherapy starting within 30 days from conjunctival biopsy or scraping cytology. 1% 5-FU was prepared in aqueous solution and administered four times a day for 4 weeks. One course was defined as 4 continuous weeks of topical chemotherapy. Patients were instructed about possible local side effects. Before instillation of the eye drop, an eye ointment (Ofloxacin 0.3%, Allergan, Irvine, California, USA) was applied to the inferior eyelid skin to minimise skin contact with the drug. The ointment was not washed off after the drops administration and patients did not receive punctual occlusion during the treatment. One medication bottle was used for one entire course, and then returned to the hospital pharmacy. Adjunctive courses were administered after 1 month of chemotherapy-free interval. Topical chemotherapy was repeated until complete clinical tumour regression or clinical evidences of lack of further tumour response. Scraping cytology was performed after 1 and 6 months of complete clinical tumour regression. Complete and partial tumour regressions were defined as the absence of any evidence of residual tumour by biomicroscopy and cytology, respectively. Tumour progression was defined as any increase in size or diffusion of the tumour outside tumour borders. Follow-up was performed monthly during treatment, and after 1, 3 and 6 months and every 6 months thereafter. Ocular surface side effects (symptoms and signs) were prospectively recorded during the treatment and follow-up. Descriptive statistics of subjects' characteristics included: percentage distribution for gender, ethnicity, affected eye and qualitative parameters (location, thickness, fornix and tarsal involvement, multifocality and histopathology) and mean, SD and range for quantitative parameters (age, clock hours of limbus involvement and LBD). The association between gender and age with patient outcome (response to 1% 5-FU treatment) was tested by Fisher's exact test and Wilcoxon-Mann-Whitney test (normal approximation with continuity correction of 0.5), respectively. Candidate predictor variables included: clock hours of limbus involvement, LBD, location, thickness, fornix and tarsal involvement, multifocality and histopathology. The association of each candidate predictor with outcome was examined using Wilcoxon-Mann-Whitney test (normal approximation with continuity correction of 0.5) and Fisher's exact test. Predictor variables associated with p<0.10 were included in a multivariate logistic regression. The model was further reduced through backward selection. The final model included predictors with p<0.05. Kaplan-Meier curves were also generated to estimate the progression-free survival. Analyses were performed by using SAS V.9.3 (SAS, Cary, North Carolina, USA). Fifty-nine patients were referred to our institutions between September 2001 and January 2009 and diagnosed as affected by OSSN. Among these patients, 41 (69%; mean age of 68±8 years; range 55–88) were treated with 1% 5-FU as primary treatment and included in this study. Clinical and demographic characteristics are reported in table 1. Cytological or histological diagnosis resulted in LGD in 20 cases (48%), HGD in 13 cases (31%) and SCC in 8 cases (19%). Mean follow-up was 105±32 months (range 60–171). Twenty-three cases underwent a single 1% 5-FU course (56%), 15 cases (36%) two courses and three cases (7%) three courses. Complete tumour regression was achieved in 34 cases (83%) after a mean of 1.5 courses (range, 1–3 courses). Mean resolution time was 11±9 weeks (range, 3–22 weeks) (figure 1). Univariate analysis showed that complete response to topical chemotherapy was significantly related to tumour thickness <1.5 mm (p=0.005), lack of fornix or tarsal involvement (p=0.015 and p=0.009, respectively), the absence of multifocality (p=0.002), histopathology (intraepithelial neoplasia vs SCC) (p=0.019) and AJCC classification (T1 classification vs T2 or T3) (p=0.028) (table 1). A multivariate analysis was also performed to correlate the response type to clinical tumour characteristics, showing that only tumour thickness >1.5 mm (p=0.045) and multifocality (p=0.023) were eventually correlated with lack of complete tumour response (table 1). No patient showed tumour progression during chemotherapy. Seven patients (17%) showing incomplete clinical response required: surgery alone (two cases) and surgery plus neoadjuvant topical MMC (five cases) (table 2). (A) Anterior segment photograph of a leukoplakic ocular surface squamous neoplasia (OSSN) before (left) and 3 months after (right) the end of topical chemotherapy. (B) Anterior segment photograph of a flat but diffuse OSSN before (left) and 3 months after (right) the end of topical chemotherapy. (C) Anterior segment photograph of a diffuse OSSN before (left), during (centre), and at the end of topical chemotherapy (right). Clinically detectable conjunctival tumour locations in patients affected by multifocal lesions reduced from a mean of 3.1 (range, 2–5) (pretreatment) to 1.0 (range, 1–2) (post-treatment) (figure 2). Among patients characterised by multifocal lesions, four eyes (44%) showed a complete tumour response. Considering the entire sample of enrolled patients, four (10%) developed late local recurrences during follow-up, after a mean of 12 months (range, 8–21 months) (table 3). These patients were treated with surgery plus topical MMC (two cases) or topical MMC alone (two cases) obtaining a complete tumour response. No correlation was found between late recurrences and primary incomplete response to chemotherapy or number of treatment courses (p>0.05). The total treatment time, length of treatment when total resolution was clinically confirmed, recurrence rate and length of follow-up related to histopathology are reported in table 3. (A) Number of conjunctival lesions in multifocal tumours before and after chemotherapy. (B) Anterior segment photograph of a lesion located in the inferior lacrimal punctum (red arrow) in a case of multifocal ocular surface squamous neoplasia before (right) and after (left) the end of topical chemotherapy. The Kaplan-Meier estimates of progression-free survival are reported in figure 3. 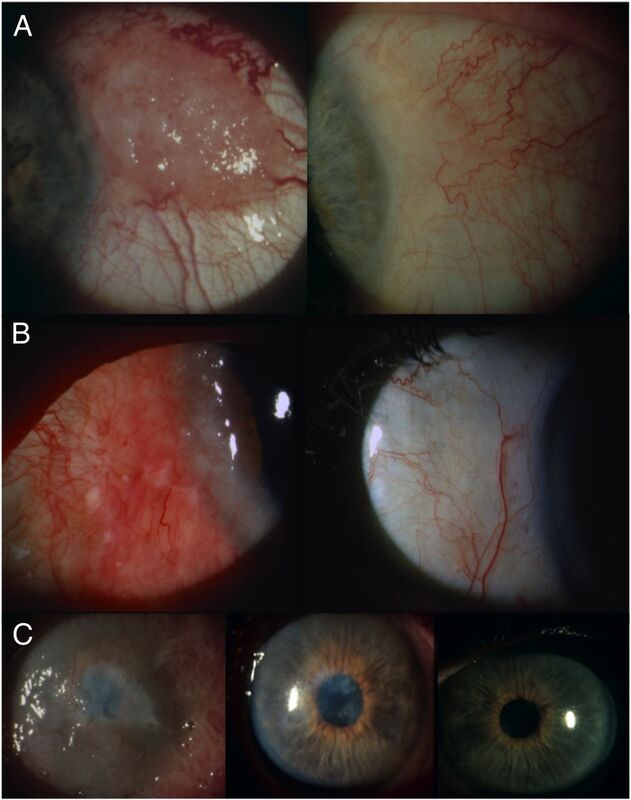 (A) Kaplan-Meier estimate of progression-free survival of the total sample (invasive ocular surface squamous neoplasia (OSSN) and preinvasive OSSN, n=41) (B) Kaplan-Meier estimate of progression-free survival of preinvasive OSSN (n=33) (C) Kaplan-Meier estimate of progression-free survival of squamous cell carcinoma (n=8). Transient, reversible and low-to-mild 5-FU local side effects were documented in 19 (48%) treated patients, including: superficial punctate keratitis in 11 patients (28%), conjunctival hyperaemia in 19 patients (48%) and lid erythema in 4 patients (8%) (table 4). All side effects disappeared within 4 weeks after the end of treatment and local treatment with lubricant eye drops. No cases of lacrimal drainage system obstruction or corneal ulceration were observed. No patient discontinued therapy due to side effects. Relatively few published reports describe the clinical effect of topical 1% 5-FU chemotherapy in the treatment of OSSN.4–12 These studies are characterised by a limited number of patients or limited follow-up.3 The present one is the largest study on long-term clinical effect of 1% 5-FU as a topical treatment of OSSN. We achieved a complete clinical and cytological regression in 83% of treated lesions, after a mean of 1.5 1% 5-FU courses, with the longest follow-up ever reported. The second major limitation in the use of topical 5-FU is tumour multifocality. Considering that multivariate analysis did not show statistical correlations between incomplete tumour response and other clinical parameters related to tumour burden (fornix and tarsal involvement, clock hours of limbus involvement, LBD and AJCC classification), the reduced activity of 5-FU in multifocal lesions, more than a sort of indirect measure of chemoresistance related to tumour burden, may be better interpreted by the presence of different biological behaviours in different parts of a multifocal tumour. Rudkin et al17 have recently reported that diffuse OSSN is often recalcitrant to initial treatment with either 1% 5-FU or 0.04% MMC, suggesting to use them as a debulking procedure. Nevertheless, in our study, a complete response was obtained in 44% of multifocal lesions. Moreover, obtaining at least a partial response (and never tumour progression), we obtained 100% long-term tumour control adding surgery, transforming topical chemotherapy into a debulking procedure. Moreover, the reduction of clinically detectable conjunctival tumour nodules in patients affected by multifocal lesions from a mean of 3.1 (range, 2–5) (pretreatment) to a mean of 1.0 nodules (range, 1–2) (post-treatment) simplified the surgical procedure in this subgroup of challenging patients (figure 2). Nevertheless, further prospective studies are essential to assess whether using topical neoadjuvant therapy for multifocal lesions is preferable to surgical excision followed by adjuvant topical treatment. Another result of the present study is that histological classification is not related to tumour response in multivariate analysis. The major limitation in this analysis is that conjunctival intraepithelial neoplasias (CINs) were classified by cytology; therefore, this result should be confirmed in a larger prospective study with histopathological confirmation. Nevertheless, 5-FU seems to be effective also in a consistent proportion of SCC, suggesting not to exclude this therapeutic approach in SCC, at least in selected cases where surgical alternatives are limited by tumour characteristics (figure 1C). Topical chemotherapy has several advantages when compared with standard surgical excision, including: the treatment of the entire ocular surface, targeting of the tumour cells, simplicity of treatment, reduced cost associated with avoidance of the surgical approach and reduced patient morbidity.11 A relevant concern in the use of topical chemotherapy is that some patients may not be fully compliant with drug administration timing and dosage. Nevertheless, in our experience, no cases of clinically significant lack of compliance were documented. Considering its safety and efficacy, 5-FU has adequate characteristics to be chosen as a first-line agent in the topical treatment of OSSN. The long-term primary complete efficacy (83%) paired with the lack of clinically relevant complication is also enhanced by the presence of at least a partial response in each patient, excluding the risk of tumour progression during treatment. Topical 5-FU, as a sole therapy, is a long-term safe and effective treatment for patients affected by preinvasive OSSN and for a limited proportion (50%) of invasive OSSN. The main clinical limitation of this treatment is elevated tumour thickness (>1.5 mm) and tumour multifocality. Nevertheless, further prospective studies are essential before recommending 5-FU as a sole treatment of invasive OSSN. We thank Dr Fabiano Cavarzeran, Department of Ophthalmology, University of Padova, Padova, Italy, for his support in the statistical analysis.
. Topical 5-fluorouracil in treating epithelial neoplasia of the conjunctiva and cornea. Ophthalmol 1995;102:1338–44.
. Conjunctival squamous cell carcinoma treated with topical 5-fluorouracil. Arch Ophthalmol 1997;1115:1000–1. AJCC Ophthalmic Oncology Task Force. Carcinoma of the conjunctiva. In: Edge SB, Byrd DR, Carducci M, et al. eds. AJC cancer staging manual. 7th edn. New York: Springer, 2009:531–8.
. Chemotherapy of neoplastic disease. In: Goodman LS, Gilman AG, Rall TW, et al. eds. The pharmacological basis of therapeutics. New York: Pergammon Press, 1990:1202–63. Contributors RP and EM: study conception, design, interpretation of data, drafting and revising, final approval. LF, SR, IT, GM, EP, SB and AF: data acquisition/analysis/interpretation, drafting and revising of work, final approval. Funding The research for this paper was financially supported by Ministry of Health and Fondazione Roma. Ethics approval Institutional Review Board of the University of Padova and G.B. Bietti Foundation.